It’s all routinely reported as Left versus Right, but those are as much misnomers as the left-over name of this corrupt conspiracy for the acquisition of power: the Australian Labor Party. The ALP died in 1983 when Paul Keating took over the radical right agenda (kidding himself that he was the ‘radical centre’). By occupying the right, the ALP pushed the Coalition to the extreme right, and Australia is a far nastier society for it. Reportedly Kevin Rudd said the Murdoch press is a political party, and it’s certainly true Murdoch is the most powerful political force in Australia. The routine ALP response has been tried before: appeasement. So we will, under the expected Shorten Government, destroy ourselves more slowly (other than those we entrap on Manus and Nauru, who will continue to die at the same or higher rates). For this we are expected to be grateful. You have to be realistic, they say. Well it’s true the ALP is not as bad as the other lot, who have been supremely destructive. But it’s also true that the so-called Labor Party is largely a band of careerists dedicated to gaining power for the sake of holding power. There is no discernible principle they are not willing to compromise. There is little discernible vision, other than to put a few bandaids on the wounds inflicted by 35 years of neoliberalism, nascent fascism and planetary destruction. Labor has been far more complicit in the destruction than in limiting it, let alone reversing it. Is it not possible to imagine we can do better? It ought to be, given some prominent examples. On the one hand Bernie Sanders and Jeremy Corbyn demonstrated you could attract unexpected support by stepping right away from the neoliberal mainstream. They are not the only ones, and it is likely they or those like them will attain power within a few years, though fascists will probably also have some wins. On the other hand the more sane among followers of the Liberal Party finally lost patience with the band of extremists and reactionary nutters who have hijacked their party. The liberals are in open rebellion and the far-right appears to be headed for the wilderness. The ALP could (but shows no inclination to) emulate Sanders and Corbyn and give up its strategy of leaving no daylight between itself and the extremists. The ALP could also, before too long, suffer the imminent fate of the Coalition, and see itself reduced to a reactionary rump while more sensible and younger people get on with what, manifestly, must be done. We have yet to see prominent independents challenging Labor incumbents, but if Labor doesn’t lift its game the idea might quickly spread to their side of politics. Well yes there are the Greens. Perhaps if they boldly stepped up to the main game of transforming the economy so all their other causes become feasible, then they might distract their membership from its internecine warfare and give it a reason to believe in winning. What else could a government do? Gosh, where to start? Put the ABC at arms length and fund it (it’s a national cultural treasure and we don’t owe Murdoch a living). Require all media to be licensed, it’s a high privilege. Require minimal standards of truth and editorial integrity in the media. Drastically restrain the banks and focus them back on serving the productive economy. Stimulate the economy by raising the minimum wage. Forget the obsession with ‘balancing’ the budget. Nationalise the electricity grid and let it be run by engineers. Ban new coal and fracking and rapidly phase out the old. Promote regenerative agriculture, to save soil and store water and carbon. Limit political donations to small, individual amounts and publicly fund qualifying political candidates. Make lobbying transparent in real time. Champion the legitimate role of government, and promote cooperation, collective activities and community. Withdraw our forces from the Middle East, where we have no business, and eliminate most of the terrorist threat. Show the world how to reduce greenhouse emissions, and help others to do so. 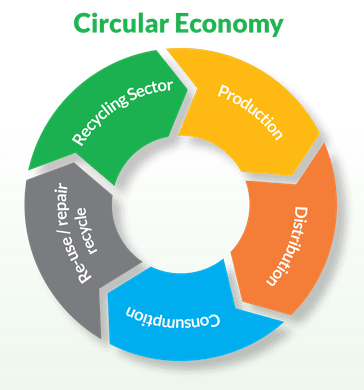 Show the world how to move towards a circular economy that extracts and dumps far less material. Those are a few examples of what we might be, if we thought we wanted to. After all, we used to be a better society, and we used to be generally moving towards even better things. Most people are confused as to why we cannot meet our GHG targets or even reign in our dependency on coal. So let me simplify it; In 2017 our population was around 25 million and we imported $377 billion worth of products including $29b worth of vehicles, $22.8b in fuel, and most of our white goods and manufactured items because we have lost our manufacturing industries. Our imports are about $15,000 per person and our population is increased by 380,700 last year so we have to increase our exports every year by $5.7b, most of which will be coal, iron ore and other minerals. Our food production is at grave risk from climate change, its possible we will become a net importer. Australia is facing more severe floods and droughts as rainfall patterns diminish over the past three decades, a new report has warned. Co-author Professor Will Steffen from the Climate Council said the report shows an intensification of drought and floods. and the services industry – O/S student education is badly managed and may collapse. It does explain why the minerals council has been a strong supporter of high immigration and the undisclosed glee when they found they were supported by the Greens. Good points Don. I hadn’t really thought about that aspect, but it’s straightforward as you lay it out. For me it helps to explain the obsession with coal – they’ve left themselves no other option to pay for all the goodies we can’t make ourselves anymore. Not that I discount clinging to a vanishing past.